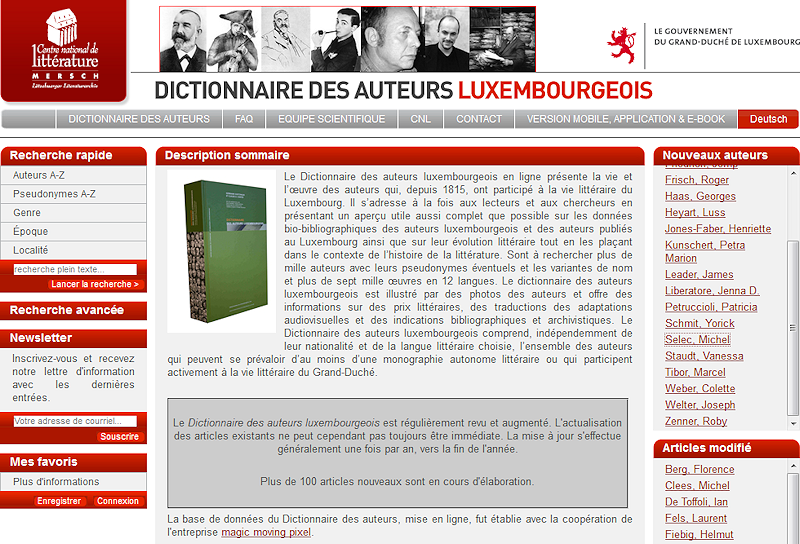 The Dictionary of Luxembourgish Authors is a bilingual piece of work (French and German) and is available online, as an application for your smartphone or as an ebook. On the right side you can consult new entries or articles that have recently been edited. Along the top you will see a selection of pictures. A simple click will lead you to the corresponding article if you want to find out more about the author in one particular picture. In the top menu you will find a link to a section presenting the people working on the dictionary and a FAQ section for most frequently asked questions. At the bottom left of your screen the 'citation/Zitiernachweis' tab explains how to correctly cite an article. Here you can search by text. If you enter the word 'vert', for example, the search result will also suggest articles that contain the words 'Prévert' or 'Cape-Vert'. If you are using the word 'banana', you will be suggested the book 'rote nelken für herkul grün' [rote nelken für herkul grün - ananas] by Roger Manderscheid. Langague : French, German, Armenian, etc. Genre: graphic novel, comedy, novel, etc. Role: illustrator, translator, composer, etc. Prize: Prix Batty Weber, etc. Journal: Dialogue, Escher Journal, etc. Profession: farmer, librarian, biologist, etc. In the result list, the name of an author displayed in red letters signifies that an article on that person is available for you to read. However, if the name is in grayed out, you have encountered a foreign author not in the dictionary. You can either search what prizes a particular author has won or you can see what authors have been awarded a particular literary prize. In the latter case you need to select the prize you are looking for and sort the result list by author, year or piece of work. A title in gray letters means that this piece of work has won the award but has not been published. 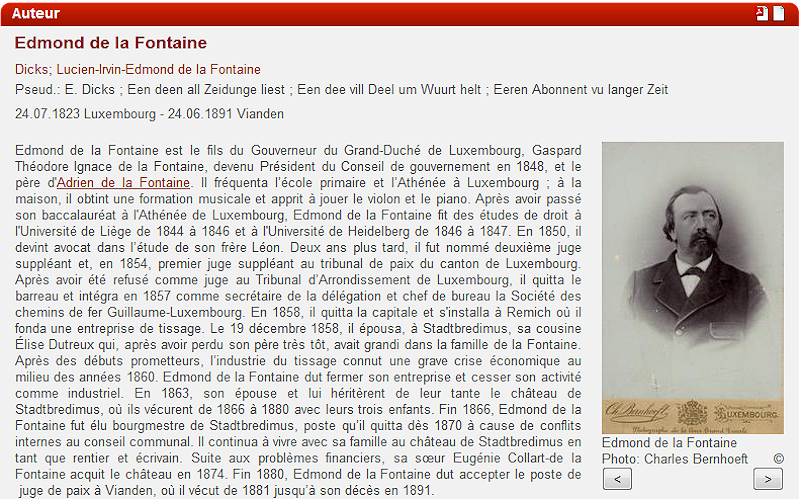 Red titles are clickable and reveal more information. You can save author references as well advanced searches under 'favourites'. If you register with an email address we will not send you any mails unless you also sign up for our newsletter which keeps you up-to-date on the dictionary.